You’ve seen the late night shopping events upon my wall. Now it’s time to tell you about the ultimate Jack Wills retail experience within this store. Whilst being from Yorkshire it’s enabled me to open up to many things and notice the retail sector of my living. My first visit to the store was within the week of its opening and I have got to say I felt right at home! (No jokes) The very well dressed front entrance to the store which is like two big doors opened with, tall staircases which adds to the characteristics of the store. The first floor is menswear which was very neatly presented whilst giving you a lovely welcoming feeling. “Welcome to Jack Wills”. I’m sorry boys but I did not stay too long in the menswear department. However you won’t be disappointed gentlemen! Coming up to the second floor which is the womenswear it was like stepping into huge stylish well-dressed closet. The classic cardigans, sweaters, loungewear amongst the accessories were placed well in their home within the department. My eyes caught the classic JW Ruby shirt in navy and pink. Which I was looking for… From then onwards the customer service experience excelled. I had the helping of one of the members of the Jack Wills team which gave me pleasurable shopping experience. (Which I look for mostly in every shop I visit). From the help of picking the correct size, to locating a dressing room, and afterwards discussing how well it fit me and style tips regarding other garments in my closet. 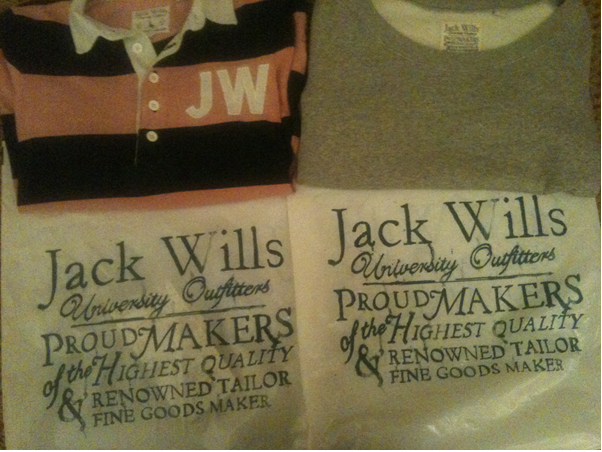 I was a very happy customer to purchase this classic Jack Wills piece. However the purchasing is friendly to your card due to this store being at Outlet prices, which makes us ladies and gentlemen look stylish more often. I’ve continued to come to the store filling my closet with many classic pieces. Just last week I made a purchased with my show hair at the ready before I performed at the Victoria Theatre. This purchase was a grey marl sweater – which was perfect since I was topping up my winter closet. I’ve got to say it was quite busy however; the standard of the customer service was still at the levels I have mentioned earlier. Which I was very pleased about…. Are you coming to the late night shopping event tonight in store? Now it’s your turn Ladies and Gentlemen. Tweet: @JW_Outlet Which features information and promotions on all the outlets Jack Wills has.